Combining Contemporary style with classic elegance our rooms and suites and apartments enjoy comfortable layouts and elegant design. Dream away in the Rex “Cloud” bed, slip away into a restful sleep restoring the body like nothing else. For that little touch of indulgence why not treat yourself to a bespoke – Spa, Steam, Sauna, Crown or Presidential suite. Offering timeless classic neutral colours, furnishings, and the Rex “Cloud” king bed. Furnishings include beautiful lamps and decorative art pieces. A dedicated work desk and lamp is ready for that business catch-up. The easy access shower with hand spray is framed by floor to ceiling tiles in the well-equipped bathroom. Offering timeless classic neutral colours, furnishings, and the Rex “Cloud” twin king beds. Furnishings include beautiful lamps and decorative art pieces. A dedicated work desk and lamp is ready for that business catch-up. The easy access shower with hand spray is framed by floor to ceiling tiles in the well-equipped bathroom. Offering timeless classic neutral colours, furnishings, and the Rex “Cloud” king beds. Furnishings include beautiful lamps and decorative art pieces. A dedicated work desk and lamp is ready for that business catch-up. The easy access shower with hand spray is framed by floor to ceiling tiles in the well-equipped bathroom. These rooms enjoy access to their own private balcony and interconnect with the adjoining Executive King Twin, for those traveling families or friends. Offering timeless classic neutral colours, furnishings, and the Rex “Cloud” king bed and King Single bed. Furnishings include beautiful lamps and decorative art pieces. A dedicated work desk and lamp is ready for that business catch-up. The easy access shower with hand spray is framed by floor to ceiling tiles in the well-equipped bathroom. These rooms enjoy access to their own private balcony. Offering timeless classic neutral colours, furnishings, and the Rex “Cloud” king bed. Furnishings include beautiful lamps and decorative art pieces. The disabled access well equipped bathroom is framed by floor to ceiling tiles. Blending classic design and decoration with luxurious detailing, these suites are classical in every sense. A separate sitting area with LCD television, lounge, arm chair and desk. Walk through to the Rex “Cloud” King bed and another LCD television. The spacious bathroom features elegant Carrera marble wall and floor tiles, a classic vanity and rainforest showers. These suites offer a sense of space and privacy exuding a sense of sophisticated calm. A separate sitting area with LCD television, lounge, arm chair and a built in work station for the executive on the move. Walk through to the Rex “Cloud” King bed and another LCD television. The bathroom features a spacious shower and your own Cedar Sauna room for two, detox and relax the body. These suites offer a sense of space and privacy; these spacious suites offer a sense of sophisticated calm. A separate sitting area with LCD television, lounge, arm chair and a built in work station for the executive on the move. Walk through to the Rex “Cloud” King bed and another LCD television. The bathroom features a spacious shower incorporating your own steam room for two, sit back and feel those stresses of the day melt away. Designed with serenity in mind these suites have a peaceful, calming décor with carefully selected decoration pieces. A combination of space and privacy, an entrance foyer with a discreet luggage drop, opens into a separate lounge sitting room with LCD television, lounge, arm chair and desk. 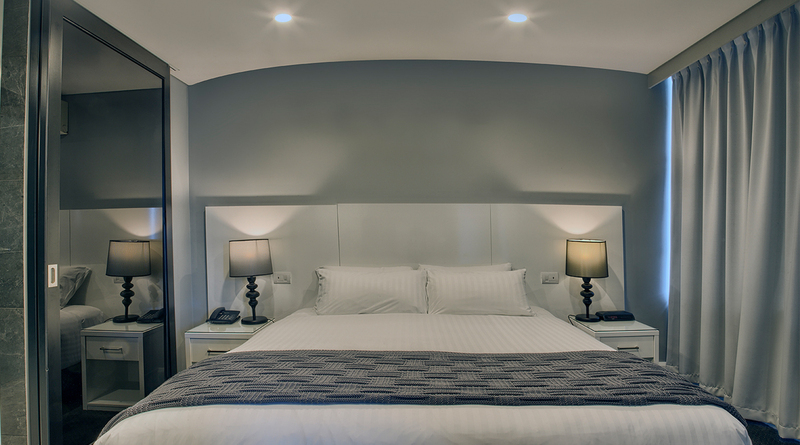 Walk through to the bedroom, the Rex “Cloud” King bed and another LCD television. Bathrooms are wonderfully appointed with a large walk in shower, vanity and separate toilet. Exquisitely designed and beautifully furnished, our magnificent Presidential Suite is our largest and most luxurious. A formal entrance leads to a wet bar and dining room with seating for eight people, a separate study with fire, living room, pantry and powder room. A large master bedroom boasts a walk in dressing room and amazing bathroom featuring a massive Jacuzzi bathtub, rainforest showers and separate toilet. This suite enjoy access to their own private balcony. The Ultimate sanctuary, offering a true “sense of place”. The décor uses classic design and decoration to detail design elements, these suites are classical in every sense. A separate sitting area with LCD television, lounge, arm chair and desk. Walk through to the Rex “Cloud” King bed and another LCD television. The spacious bathroom features elegant Carrera marble wall and floor tiles, a double vanity, rainforest showers, and an amazing spa bath for two where you can lie back and forget the world while watching your own LCD television. These suites enjoy access to their own private balcony. Providing the perfect base for business and leisure residents, our one bedroom apartments offer a luxurious ambience and a host of facilities. Stunningly designed in a contemporary style, apartments are carpeted throughout, enjoying a cleverly designed layout incorporating eating, relaxing, working and cooking areas. Furnished with a Rex “Cloud” King bed, the master bedroom enjoys the benefit of large robe storage and separate bathroom with laundry. The living area is divided into zones with a seating area complete with sofa, dining area with table, workspace desk, and fully equipped kitchen. These apartments enjoy access to their own private balcony a secure basement carpark and storage area. These spacious apartments effortlessly combine stylish contemporary aesthetics with a thoughtfully designed layout. With floor to ceiling windows flooding the space with light, apartments enjoy a real sense of calm and space. Furnishings include a Rex “Cloud” King bed to the master bedroom, and the choice of either a king or twin beds in the second bedroom. The bathroom and laundry are classically well appointed. The living space is divided into zones including a dining area with a table for four guests, a sitting area with a sofa, workspace desk, and fully equipped kitchen. The contemporary design of these spacious apartments embodies both modern elegance and luxurious comfort. Furnished with a Rex “Cloud” King bed to the master bedroom with an ensuite, and the choice of either a king or twin beds in the second bedroom and a second bathroom. The living space is divided into zones including a dining area with a table for four guests, a sitting area with a sofa, workspace desk, and fully equipped kitchen.